Determined to build on its reputation for painstaking and meticulous investigations, the Independent Corrupt Practices and Other Related Offences Commission (ICPC) is leaving no stone unturned in its effort to upgrade its forensic laboratory. 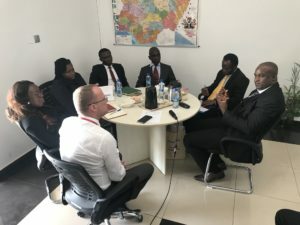 This drive recently made the Commission’s Acting Chairman, Dr. Musa Usman Abubakar, to seek further collaboration and mutual partnership between the Commission and Deutsche Gesellschaft Fur Internationale Zusammenarbeit (GIZ) GmbH in Abuja. GIZ GmbH is a German non-governmental organisation (NGO) that provides services in the field of international development cooperation. Mr. Abubakar told the Project Manager of GIZ, Mr. Harlmul Zander, at an interaction in Abuja that the Commission had set up a forensic laboratory which had helped its investigations in no small way, but stressed that there was need to beef up the operations of the unit by introducing state-of-the-art and cutting-edge technologies as well as capacity building for staff. The ICPC Acting Chairman recalled how GIZ had provided opportunities for training to some staff of the Commission in the past, and expressed his immense gratitude to the management of GIZ for that gesture. He, however, added that the Commission desired further collaboration with the organisation. He praised Nigeria for its strides in criminal justice administration and observed thus: “Nigeria is on the right path as forensic is coming to play, but still more has to be done”. The GIZ Project Manager, thereafter, declared his organisation’s readiness to provide more manpower training for the Commission, even as he expressed his intention to pay a visit to the Forensic Unit of the Commission.